As I was healing my body from hypoglycemia, I avoided any unsprouted grains. However, buying sprouted bread at the store was no cheap endeavor. So, I began searching for recipes to make my own sprouted bread at home. 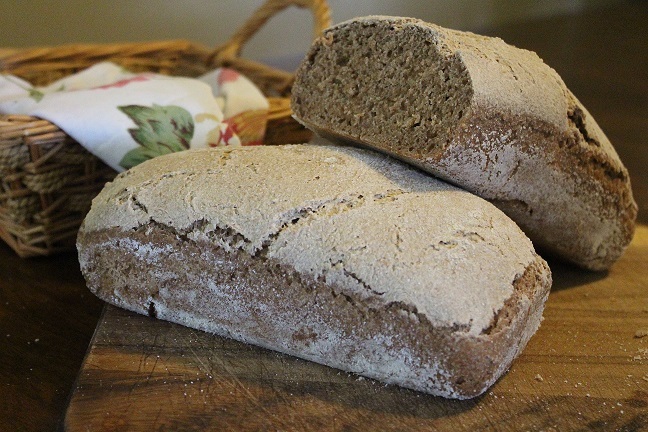 It was a bit of a more lengthy process than just making bread from flour, but it was so worth the health benefits. Plus, after learning about all the issues with gluten, I didn’t want any extra in my sprouted bread! So we lived on sprouted bread for quite some time while with God’s help, I healed my pancreas through a real foods diet. Note: You will need to sprout half of a gallon sized bucket of spelt berries – half of them you will use wet, the other half will need to be dried and milled. For my process of sprouting, see end of recipe. Place wet berries and water in food processor or Blendtec type blender. Pulverize until in a smooth, dough-like consistency (or your blender starts dancing around the counter). Pour above dough into a mixer along with the rest of the ingredients. Mix on medium until dough is formed and is elastic. If too sticky, add more flour, if too dry, add more starter or water. Divide into 2 equal balls, round out to loaves and place in well-greased and floured bread pans (I use palm shortening to grease and brown rice flour to dust). Allow to rise on the counter until almost to the top of the pan (remember it does not rise much) -about 4-5 hours. Bake in a preheated oven at 350 for between 40-50 minutes. Allow to cool completely before slicing, if you can stand it. It locks in the flavor nicely. Though I have not seen any studies on the gluten level of sprouted grains, I sense that it is low to non-existent. If there were more gluten, the dough would rise, for one. But for another, I would react to it. Since neither is happening around here, I am pretty happy with my sprouted grains as a nourishing option. Two nights in advance, I soak the spelt berries in a plastic gallon bucket. Next morning, I drain off the water (could be recycled into rejuvalac or for chickens). I place the berries in 2 strainers, rinse a bit, and cover with towel (to keep pests away, or nosy kids). That evening, I usually see some tails, so I place half of the berries in baking sheets and put in the oven on the lowest temp (170) for the night (12-18 hours). The other half goes into a bag and into the fridge. The next morning, if the berries are completely dry, I mill them. I now have flour, and wet berries ready to go for the bread. Extra berries can be used to make sprouted pancakes or muffins (with sourdough starter, no less- stay tuned for the recipes! Find more Real Food recipes at Kelly The Kitchen Kop’s Real Food Wednesdays. I am new to baking and was wondering if any of you have ever used any starters from Sourdough’s International.. I have a friend who loves it but I’m looking for some more opinions. Hi Rachael! No, I do not have any experience with them. I got my starter from a friend. But I have used starters from Cultures For Health with good success. Happy baking!